Hola, hola Amigo Pancho! How long can you stay alive? Amigo Pancho is escaping to his enemies trough canyon. He is holding two baloons which can pop any time...because too many sharp objects are around. Let's play and enjoy! 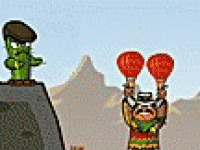 Choose related Amigo Pancho game online.